“Outta’ Here” is a funky vibes trio recording dedicated to and inspired by the 2008 Philadelphia Phillies and the late great Harry Kalas. Perfect for the baseball loving jazz fan! 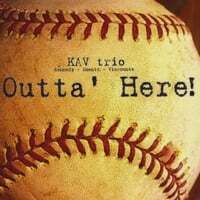 “Outta’ Here”, released in Philadelphia on the 4th of July 2010, is the debut recording by the KAV trio, featuring Anthony Viscounte on vibraphone and marimba, Mark Amentt on bass, Sean J. Kennedy on drumset and percussion, with guest artist Paul Vasquez on guitar. This collective effort pays tribute to former Philadelphia Phillies announcer Harry Kalas. The seven compositions on this disc span a variety of genres and depict a special aspect of the Philadelphia Phillies, Kalas, and the special 2008 World Series Championship run. Born and raised on the Galapagos Islands, the Philly Phanatic made his move to the mainland in 1977 when he became the official mascot of the Philadelphia Phillies. Named after the Phanatical Phans that booed pitcher Burt Hooten off of the field in the 1977 NLCS, this furry green creature has been a mainstay at Phillies games for the past three decades. This phunk chart is divided into two sections. The first depicts the lighter side of the game and the joy and levity the Phanatic brings to the ballpark. The second draws your attention back to the seriousness and heart-wrenching intensity of the game itself. Tug McGraw, Mitch Williams, Brad Lidge. These are some of the most famous Phillies bullpen names of the past 30 years. The key to any great bullpen arm is the ability to have a short memory. If you fail one day, you have to forget about it and get right back out there the next. “Bullpen Blues” is a molasses-soaked dirty blues that attempts to examine the bullpen woes that come and go with every baseball team. With a bridge inspired by a motif from George Gershwin’s “Rhapsody in Blue”, this track shows the down times throughout a season that Phillies phans hope never occur! The unofficial start of spring occurs as pitchers and catchers report to Clearwater, Florida for the start of Spring Training. Good weather and good times are on the horizon as baseball’s return is just around the corner. Whether it is an early morning breakfast at Lenny’s Diner or a grouper sandwich at the ballpark, Phillies phans come in waves to the Carpenter Complex to get their first glimpse at the new team. Based on the traditional “Gaelic Beannacht”, “Clearwater Morning” depicts the peace and happiness of what is to come: family and friends, hot dogs and burgers on the grill, summers at the shore, and baseball at the ballpark. As a new season gets set to begin, we all have hope and optimism about what is to come in the future. Ryan Howard burst onto the scene in Philadelphia in 2005 and hasn’t looked back. As the 2005 NL Rookie of the Year, 2006 NL MVP, and a member of the 2008 World Series Champion Phillies, Howard has made quite the impact in his career. However, he is probably most known for his titanic home runs. Howard is the fastest player in Major League Baseball history to reach 50, 100, 150, and 200 home runs. Even faster than Babe Ruth! Howard’s home runs send a jolt throughout Citizen’s Bank Park every time he connects and sends one out of the ballpark. Book ended by the roar of the crowd, this chart quickly picks up the pace as the Big Man sends another homer into orbit. Featuring a trading fours section between Viscounte and Kennedy as well as a great solo from Amentt, this track depicts the excitement felt throughout the city as Ryan Howard and the Phillies bats come to life. Every baseball fan hopes their team plays into late October and “October Wind” portrays the bittersweet time surrounding a playoff run: the jubilation and apex of one season colliding with the realization that another year is about to come to an end. While baseball is often described as a 162-game marathon, come October, it turns into a sprint. Inspired by the chilliest winds that flow throughout October as Phillies fans witness postseason magic, this tune switches from major and minor tonalities to indicate the differences between our ups and downs and our wins and losses. The tune ends in euphoric fashion just as the 2008 season did for Phillies fans. Chicago has the Curse of the Billy Goat. Boston had the Curse of the Bambino. Well Philadelphia had the Curse of Billy Penn. In 1987, construction on One Liberty Place was completed in downtown Philadelphia. The structure became the tallest building in the city surpassing the William Penn statue that sits atop Philadelphia City Hall. From that point on, a hex was placed on the professional sports teams throughout the city. It did not matter if we placed a Flyers jersey or a Phillies hat on top of Billy Penn; now that the statue wasn’t the highest point in the city, Philadelphia teams were destined to lose. The 1987 Flyers lost a heartbreaking Game 7 in the Stanley Cup Finals. The 1993 Phillies lost to Joe Carter and the Toronto Blue Jays in the World Series. The ’97 Flyers, ’01 Sixers, and ’02-05 Eagles all came up short in the end. Even our college basketball teams couldn’t get over the hump to reach the Final Four! However, that all changed in the summer of 2008. The Comcast Center opened in downtown Philadelphia and became the tallest building in the city. Upon completion of the final beams on the roof, two construction workers placed a 4-inch plastic statue of William Penn at the top of the building making it the highest point in the city once again. Just like that, the curse was broken. After 25 years of heartbreak and “maybe next year” for Philadelphia, the Phillies won their first championship since 1980 and allowed the city of Brotherly Love to become the city of champions once again. He was simply the voice of our summers. Harry Kalas became the play-by-play announcer of the Philadelphia Phillies in 1971 and for 38 years captured the hearts of Phillies fans across the Delaware Valley. “Outta’ Here” portrays the warm and welcoming voice of Kalas as he broadcast games on radio and television throughout the season. This warm, tropical relaxed groove quotes “Take Me Out to the Ball Game” in the melody and in the end fades slowly with the peaceful sounds of nature. Known for his classic home run calls and deep, unique voice, Kalas teamed with Richie Ashburn to become one of the best duos in the business. Their friendship and camaraderie was truly genuine and gave fans the gift of listening to two best friends talk about baseball throughout the summer. When the Phillies won the World Series in 1980, Kalas and Ashburn were not allowed to announce the game due to national television rights. However, 28 years later, HK finally got the chance to make his signature call. “The 0-2 pitch, SWING AND A MISS! HE STRUCK HIM OUT! THE PHILADELPHIA PHILLIES ARE WORLD CHAMPIONS OF BASEBALL!” Just 6 months later, Kalas passed away at the age of 73 but not before his booming voice got the chance to call his beloved Phillies World Champions.